Ore-sama is getting his feet all cakey!! Kesesesese, Zis cake is just as awesome az me! I am ze Awesome Prussia!!!!!!!!!! Ok I really want this cake!! I wish I had this cake for my birthday! *le gasp* I-Is that... A Belarus figure..? i want that as my cake!! i couldnt stop saying "Oh mien gott~! Me want!! Me gusta!! xDDD"
You have THE BEST Cake EVA!!!! *0* DUDE I NEED THAT CAAAAAAAAAAKE!!!!!! YES!! DO IT!!! YOU NEVER NEED A REASON FOR CAKE!!! aww thats too bad! When I got them they were pretty cheap. This is awesome! I totally want a cake like this for my birthday. 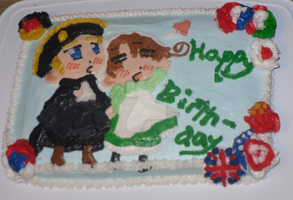 From where did you got the figures for the cake? LOL! YESH GILBERT SHALL RULE THE WORLD!!! Who make the cake and how they make the cake round?